The reason, the main reason, so many people have moved to Kiawah and Seabrook Islands over the past twenty-odd years is the environment. Coming from major metropolitan cities and centers of business and bustle, the islands are a place of peace, where birds as tall as teenagers strut through pristine marshlands, and does and their fawns pick delicately through the thick maritime forests. Rosebank Farms is one of those places of peace, where families come to reacquaint themselves – literally – with their roots. On days such as the annual Hyrdrangea Festival in late May, it is a pleasure to simply stand on the grassy hills overlooking the hydrangea and rose beds, and rows of vegetables growing fast and strong in the rich soil, and simply breathe in the sweet smell of damp earth, the warm salt air mingling with the bouquet of melon blossoms and vibrant-purple okra flowers, and feel purely and joyously alive. Sadly, Rosebank Farms may no longer be around next year. Land owner and island icon Betty Stringfellow explained her reasons for clearing the two acre property on Betsy Kerrison Road where the Rosebank Farms produce stand is located by stating that she is getting ready to celebrate her 90th birthday, and with her only child suffering from bone cancer, Betty felt it was time to put all of her affairs in order. A noted historian in her own right, Betty is the reason that the Johns Island Museum, a school house dating back to the 1800s, is located on the produce stand property, and her book, A Place Called St. Johns, is an excellent source of information for anyone wishing to know more about Johns Island and it’s illustrious (and infamous) past. Betty’s family at one point owned all of Seabrook Island and a large portion of Kiawah, as well as a significant part of southern Johns Island. The land where the Rosebank Stand is located belongs solely to Betty due to a brief transaction with a local Lutheran church in the 1970s, and the surrounding acreage where much of the Rosebank Farms produce is grown belongs to Betty’s sisters, Dotsie and Marie. The animals at Rosebank are one of the great draws for young families in Charleston County. Ducks, rabbits, Guinea Hens, chickens, peacocks and turkeys can often be found running freely on the property, and more often than not, you’ll find a nesting hen brooding under a display of fine local art. A beautiful miniature Brahma Bull named Ida-Claire is happy to nuzzle anyone who scratches her back, and the Shetland pony, Marsh Tacky, is a favorite during the farm’s many festivals as she quick steps in shaggy luster at the front of a scaled-down carriage laden with laughing children. “I would miss it a lot,” said Marie Beckett, Betty Stringfellow’s sister and co-owner of the stand’s surrounding farmland. “My kids and grandkids go all the time, every day in the summer, and they love to visit the animals.” And more than just her family will miss the small stand which has grown so quickly into such a beloved landmark. The festivals, the animals, the fresh food and simply the opportunity to stand on the land and see your dinner digging its strong roots into the island soil before plucking it for the table is an opportunity rarely afforded to city dwellers in this day and age, and every chance to experience it is obviously, when you look at the amazing turnouts at all of Rosebank’s festivals, greatly appreciated. In the end, however, it is a family matter. If the stand does close, the last day will be January 30, 2011. Everyone is welcome to come by beforehand, though, and share their favorite memories of Rosebank Farms. If you wish to write the farm, you can send your letters to 4455 Betsy Kerrison Blvd., Johns Island, SC 29455. Marie is not Ms. Stringfellow’s sister. Marie’s mother was Ms. Stringfellow’s sister. I was saddened to read the article in today’s Letter to the Editor, as well as the above article. When reading the history above and the reason for a possible closeure in January, it is disharting for Mrs. Stringfellow and her family to have to make such a decision. Some decisions are harder to make then others. 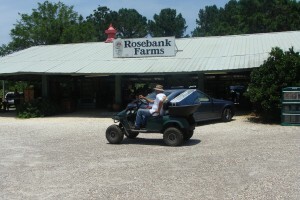 Myself, I have being going to Rosebank Farms more years than I can count. My husband is one of their vendors and I can truly say We will miss Sidi, Louise and all their wonderful loyal staff. If a decision is made to close, Charleston will loose a piece of history. If there is a possible agreement, that would be wonderful. Either way we do send Mrs. Stringfellow our best wishes for what her family is going through. Charleston and Johns Island will lose one of the great Treasures of the Island Life Style. Sidi and Louise have Added a Memorable Experience for a Visit to the Low Country to One and All..